New York, 11 May 2018 — The international medical humanitarian organization Doctors Without Borders/Médecins Sans Frontières (MSF) made the following statement today in reaction to President Donald Trump’s speech on drug pricing. Trump stated that, “When foreign governments extort unreasonably low prices from US drug makers, Americans have to pay more to subsidize the enormous cost of research and development. ... It’s time to end the global freeloading once and for all." "President Trump argued today that one of the reasons behind high prescription drug prices is that other countries charge too little and are ‘freeloading’ on American innovation. But lifesaving medicines aren’t more expensive here because they cost less elsewhere. 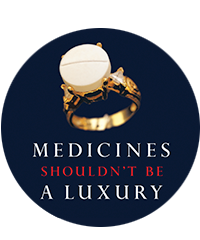 High drug prices and a lack of new and appropriate medicines is a globally-recognized concern. Every day, all over the world, MSF sees the detrimental effects of high prices—from doctors being left without antibiotics to treat people with drug-resistant infections, to hepatitis C medicines being rationed to the sickest patients because of their exorbitant prices. The U.S. is missing another opportunity to increase access to lifesaving medicines for people here and abroad. People everywhere deserve more than a surface-level solution to an access crisis that will only continue to get worse if the government fails to address the root problem leading to high prices and a lack of new medical products: a broken research and development system that allows companies to benefit from taxpayer-funded research while charging whatever prices they want. If the U.S. government really wants to lower drug prices they need to go further than these proposals; considering all 210 drugs approved in the U.S. between 2010 and 2016 that either directly or indirectly benefited from publicly-funded research, they could influence prices by requiring pharmaceutical corporations make a commitment that any product they sell that was researched and developed using taxpayer dollars like public university support or National Institutes of Health grants is actually accessible and affordable for the public. And if the government really wants to make sure people have the medicines they need, they should reform existing incentives to encourage companies to invest in products that truly meet public health needs. In the U.S., pharmaceutical corporation Gilead launched hepatitis C medicine sofosbuvir at $1,000 per pill in 2013 even though studies show a full 12-week treatment course could be produced for as little as $101.